Adventure, Romance and War. 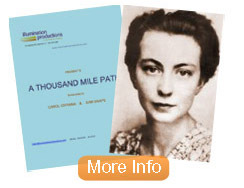 The true story of the creator of The Comet Line, Andree de Jongh, a 24 year old Belgian girl, who created the greatest escape route for allied fliers during WWII. It's a thousand miles of pure courage and determination and heart breaking romance. 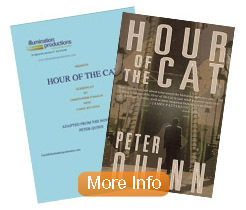 Peter Quinn's fabulous "spy-noir" novel, adapted to screenplay . A murder in New York City in 1938 seems at first to be just another homicide, it turns out to be anything but. Because its not just murder its war. The Nazi's have arrived in New York City and the fictional and fabulous Private Investigator, Fintan Dunne, is the first American to do battle with them on the eve of WWII. Fintan Dunne is back at it, this time trying to solve the mystery of the Disappearance of Judge Crater, who stepped into a cab in August of 1930 and was never seen or heard of again. 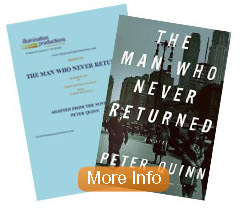 Peter Quinn's novel painstakingly recreates the circumstances of this true story and using his fictional Dunne he comes up with an astonishing conclusion. Michael Goodwin's popular novel comes to film, adapted as a dramatic series for Television. A Vulture Investor has a change of heart and sets out to use his financial wits and skill to save a company another Vulture has his eye on to plunder. 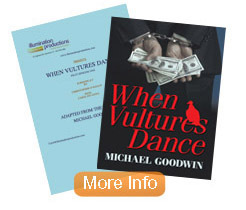 What Happens when vultures dance, suicide, attempted murder and insider trading happens and that's just the beginning. Screenplay by Christopher O'Hagan and Carol Iovanna. A Documentary about the true life of Miss America 1995 Heather Whitestone who is deaf, as seen on PBS Stations across the country. It is the amazing story of her struggle to live in the hearing world and her stupendous rise to become Miss America. But after meeting that challenge, her greatest challenge was yet to come. Written, Produced, and Directed by Carol Iovanna.